Here she describes how her confidence has grown and how the Big Local partnership has turned the dream of community-owned parks into an exciting reality – with a sustainable income stream and high quality housing too. “I really think Diamond Park is a special place, it’s peaceful and warming – which isn’t something you’d expect to see in the middle of an area like Birchwood. I think the work we’re doing is a great way to capture hearts and minds in the area. For the last two to three years, Diamond Park in Birchwood, near Lincoln, has been closed to the public. The local church, who previously supported the park, could no longer afford to run it. The grass has been damaged, and new play equipment needs to be installed for the kids. It doesn’t help that the worst of the problem is centred around the children’s play areas! We have become a community land trust to manage Diamond Park and other green spaces, and aim to reopen it at the end of the year. We have also set up a group called Friends of Diamond Park that we hope will take over the park in the future. Big Local funding only goes so far. For the sake of everyone living in Birchwood we have to think about the future. We want to secure a revenue stream for another green space, Jasmine Green. This sizeable area of land is currently owned by the council and we’re hoping they will transfer some of it to our community land trust. We’re aiming to build 62 dwellings that will be accommodation for the over 50’s. We’re working very closely with a local building firm that specialise in the aged to make sure they’re the best quality for the people who need them. The ground rent from the housing scheme will be used create play areas and provide equipment, and to maintain the park in the future. Since the very beginning, we’ve tried to get residents involved and make it clear that Big Local is for them. When we took on Diamond Park and decided to invest in new play equipment, we took three designs out to the local primary schools and asked the kids to vote on their favourite. The one that won got more than half the votes overall, and that’s the one we’re going to build. We’re trying something similar with the teenagers in the area. We’re also supported by a pastor at a local church who is doing events and bringing in teenagers. 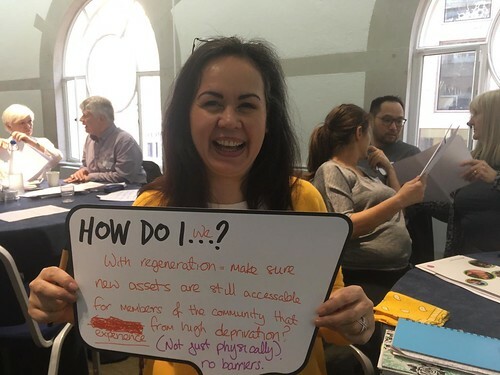 This is alongside asking residents at every step of the way what they want, what do they need, and ensuring this is at the heart of everything we do. We’re also really dedicated to building networks, and connecting with as many different groups as possible because that’s how we’re going to keep all this going after the programme has ended. I’m the partnership lead for everything related to parks and green spaces in Birchwood, mostly because I’ve got a heart for children and it was awful seeing kids playing in the street. The reason I got involved to start with is because I just wanted somewhere to walk my dog, and it’s just become a bigger part of my life. Last year Big Local sent me on a course about team leaders and leadership at Northern College and it did me good getting out of my comfort zone, having to make decisions. What it made me realise was that I could either fail or have a good go – and I decided to have a good go. I would say to anyone that’s not sure of themselves is if I can do something at my age, you can definitely do it. What I want is for people to realise that you might have a dream that feels unattainable, but you don’t know until you try." Yvonne's story is also featured in Julian Dobson's essay New seeds beneath the snow?